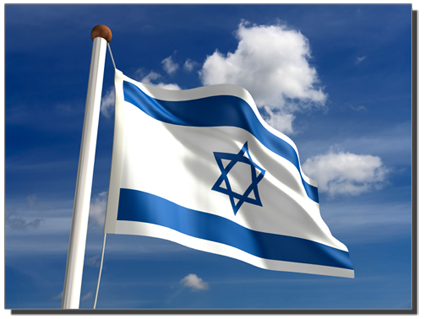 The emblem on Israel's flag, popularly known as the "star of David,"
is, in fact, the "star of Saturn" - an occult symbol. The esoteric meaning is: "As above, so below." Of all peoples on earth, the ancient Israelites were highly honored to be the depositories of Heaven’s truth. Yahuwah intended that they would be as “a city set on a hill that cannot be hid.” (See Matthew 5:14.) The wealth of truth given to the ancient Israelites is still, largely, believed by the Jews of today. Thus, the errors they cling to typically fall more under the category of rejection of new truth, rather than any tremendous amount of pagan error entwined within the truths they do believe. Following is a generalized list of the truths that the majority of Jews reject. Contrary to popular opinion, the Jews today do not, in fact, worship on the Biblical seventh day Sabbath. Following the Council of Nicea in the fourth century, the Jews and apostolic Christians suffered severe persecution for attempting to worship by the Biblical luni-solar calendar. This severe persecution was the motivating factor behind Hillel II’s reform of the calendar. Jewish scholars readily admit that the luni-solar calendar they use today is different than the one used by Moses. Jews today not only do not worship on the true seventh day Sabbath (lunar Sabbath), but they do worship on Saturday. While Saturday as such did not exist in the ancient calendars, days dedicated to the worship of Saturn did exist. Scripture is clear that worship of Saturn on his day was treason and rebellion against Yahuwah. Holy Scripture records the ancient Israelites participating in the worship of this blood-thirsty god. The times of Israel’s greatest apostasies were always centered around the worship of Saturn on his day. With the substitution of Saturday for the true Biblical Sabbath, the Jews of today are continuing in the path of their ancient forefathers and sinning against Heaven. By setting aside the original calendar of Creation, which was later restored by Moses, the Jews of today do not always observe the annual feasts of Yahuwah on their proper days as specified in Leviticus 23. When Hillel II modified the calendar in the fourth century to escape persecution, rules of postponement were adopted to accommodate the continuous weekly cycle of the pagan Julian calendar. These rules did not exist prior to that time. Thus, when used, the observance of Yahuwah’s holy days are sometimes postponed and do not align with the real holy days. Jews do not accept Yahushua as their long-awaited Messiah. While some acknowledge Him as a “good man,” they reject Him as the Son of Yahuwah, the Annointed of Yah, the Promised Messiah. In doing this, they reject the writings of Daniel which pinpointed the time of the Messiah’s arrival. (See Daniel 9:24-27.) This leads to other errors. While Yahushua is preparing to return for His people the second time, Jews are still looking for His first arrival. The Great and Eternal I AM is now calling His children out of incorrect Jewish traditions and inviting all to accept full truth and a closer, more intimate relationship with Him.